Residencial Raio de Sol Ap 18 - excellent apartment with great location. 2 bedroom apartment for up to 06 people in Ponta das Canas. Apt duplex of 80m2 double bedroom with air conditioning with balcony corridor with bathroom another bedroom with bunk bed (bed underneath turns into double bed, plus a single bed with air conditioning, ground floor with living room, tv, sofa, small table, other bathroom, kitchen and service area with tank, clothesline and portable barbecue., wi-fi. Parking space in front of the apt. Suitable for up to 6 people. We offer bed linen. Period from December 24 until Carnival we have night security. Excelente escolha para férias em Floripa. Uma ótima escolha de onde passar férias em Florianópolis, lugar com segurança (que hoje em dia é fundamental) dia e noite, fomos recebidos e tratados muito bem por sinal, ótima localização, próximo a várias praias belas, ideal para quem quer passar as férias com tranquilidade e segurança. Ponta das Canas beach calm sea beach with clear waters and saves lives, bars and restaurants on the seashore. With boat rentals at the local Marina, boat rides, diving school less than 300 meters and supermarket 100 meters from Residencial Raio de Sol. With privileged location giving easy access to all the other beaches of the north of the island. Praia da Lagoinha at 600 meters from the Residencial Raio de Sol beach with good restaurants by the sea, beach of beautiful waters intercalando between days of calm sea and days of many waves. Brava beach is 1KM from the busy seaside resort great for surfing with surfing lessons on the beach and paragliding beach top flights of the moment lots of beautiful and cheerful people. 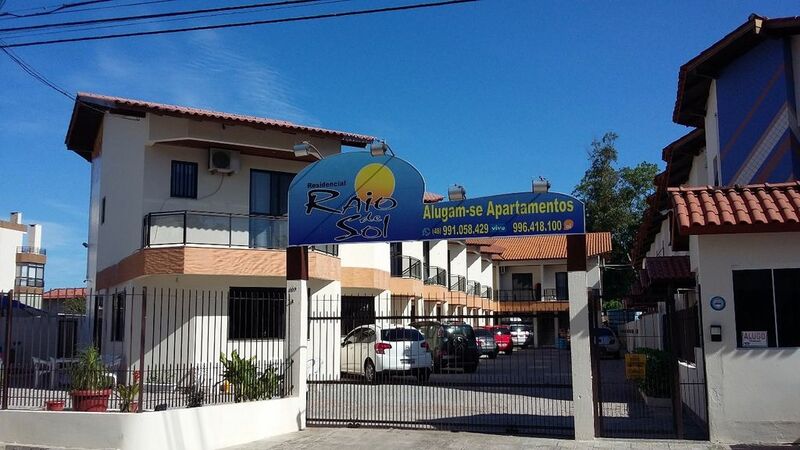 Cachoeira do Bom Jesus beach is 3 km from the Residencial Raio de Sol calm and clean sea. Canasvieiras beach 6KM with cafes and varied shops. Jurerê Internacional Beach at 12 KM from the Residencial beach of beautiful people, bars, restaurants, ballads and very luxury. Praia do Forte beach with good restaurants and visit to the fort of São José da Ponta Grossa generally calm sea. Santo Antonio and Sambaqui is 15 KM from the Residencial excellent and varied gastronomic border. Center of Florianópolis visits the museums and the Public Market, bridge Hercilio Luz, Metropolitan Cathedral of Florianópolis. Santinho beach beautiful sea beach for surfing with trail ride and visitation for rock inscriptions. Shopping Floripa: it is 10 KM from the Residencial. Shopping Seaside: it is 30 KM from the Residencial. Shopping Iguatemi: is 25 KM from the Residencial. Parque Aquatico: Aqua Show is 10 KM from the Residencial on the way to Praia dos Ingleses.